A historical marker is being publicly unveiled on Friday afternoon to remember a Spokane man’s courageous actions more than 150 years ago. Amos Bradley fought in the Civil War, and for his bravery he became the recipient of one of the first Congressional Medals of Honor ever awarded in the United States. Bradley later moved to Spokane in 1885, and lived here until his death in 1894. To honor the late Spokane veteran, a new historical marker is being dedicated in his memory at Greenwood Memorial Terrace. The monument was erected in part by the Fairmount Memorial Association. Faimount's VP of Operations David Ittner says that although Bradley already had a government marker on his grave, it's now time to give him a monument. “He's the last Congressional award winner to not have a historic monument," at one of the Fairmount Memorial Association cemetery parks, Ittner says. He says each year Fairmount picks a person to commemorate with a monument. All of the historical markers, however, represent significant individuals who were important in the history or development of Spokane. 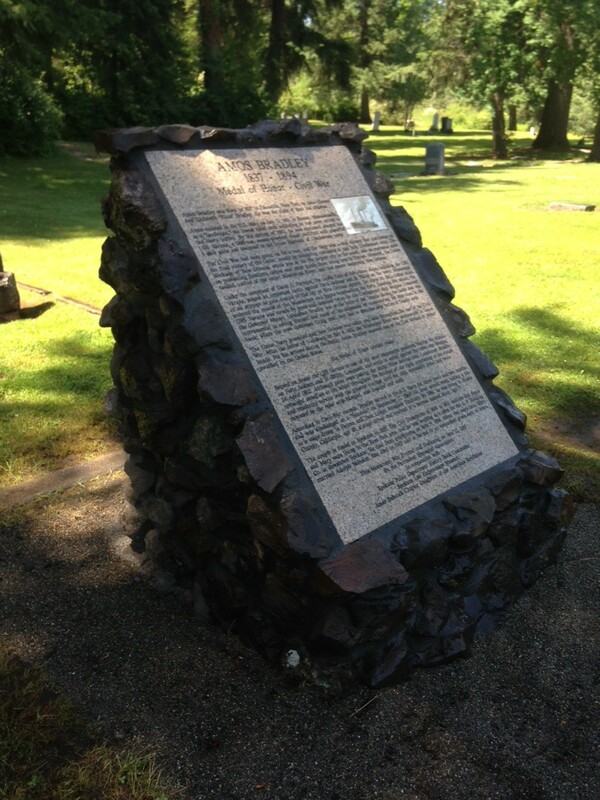 Bradley’s is the twenty-third historical monument dedicated by the Fairmount Memorial Association, in cooperation with The Spokane Law Enforcement Museum and the SPD History Book Committee. Though it happened a century and a half ago, Amos Bradley fought a hard fight to earn his modern honor. Bradley enlisted in the U.S. Navy as a “landsman," a title given to those who'd never served in the Navy before. He was aboard a ship in the Union fleet, the USS Varuna, during an important battle on April 24, 1862, against Forts Jackson and St. Philip to gain control of New Orleans. During battle, the USS Varuna was struck by gunfire and rammed twice by a Confederate ship. Bradley was at the helm of the ship and was able to save himself and his shipmates by maneuvering close to the bank. The crew continued firing until they had to abandon ship before it sank. In the end, the Union Navy prevailed and held New Orleans throughout the rest of the war. Bradley’s valiant efforts during this battle earned him the nation's highest honor. He served in the Navy for about three years before being discharged as a seaman. Others chosen in the past to be honored by Fairmount's Historic Monument Program include Spokane’s first female physician, Dr. Mary Latham, who served residents in the late 1800s and early 1900s, and Army Sgt. 1st Class Bruce A. Grandstaff, who lost his life fighting in the Vietnam War. Latham, Grandstaff and now Bradley are three of nine total people with historic gravesite markers at Greenwood Memorial Terrace. For more of the stories behind and the location of other historical markers at Greenwood Memorial Terrace, Fairmount Memorial Park and Riverside Memorial Park, visit the Fairmount Memorial Association website. The dedication ceremony for Amos Bradley is set for Friday, June 12, at 2 pm on the second level of the Greenwood Memorial Terrace.